I had been eating ramen nearly every day for a week, but I was switching up styles regularly enough that I wasn't feeling fatigued at all. Every day I would come home and think "OK, I'm gonna take a break, that's enough ramen for a while." Then every morning I would wake up and browse ramen magazines and sites and think "yeah, I could go for ramen today." Somehow I had even managed to lose weight while on this diet. I figured I had done shio and tonkotsu this week, so it was time to mix it up and try something different again, so for lunch I rode my bike to the other side of the tracks to go check out Ore no Sora (My Sky). I had heard Ore no Sora can get long lines, but I went on the tail end of lunch, so I squeezed in just fine. I did notice benches out front, a telltale sign of a store's popularity. The shop is kind of tucked away next to the tracks off the main drag, in a little bit of an older neighborhood, so it doesn't get a lot of passerby dropping in. With so many shops around, people make an effort to get to Ore no Sora, even if it is only a few hundred meters off the main street. Ore no Sora (apparently named after a popular manga) is clearly all business about its noodles. 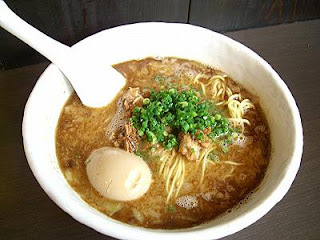 The "menu," as it were, is extremely minimalist, with only a choice between "kake butasoba" and "tsuke butasoba" (literally pig soup noodles and pig dipping noodles). There were buttons on the ticket machine for gyôza and a few other items, but they were all sold out. One suprising thing was the fact that a place like this offered a kaedama. The interior was kind of rough around the edges in an unreconstructed but nonetheless chic way. No decoration to speak of, stained walls and open pipes, but in a way that was more postmodernist architecture than neighborhood dive. I got the kakesoba (soup noodles), but the cook didn't hear me ask for no roast pork over the blasting radio, so I ended up with several large chunks with my noodles. Rather than standard châshû, Ore no Sora uses kakuni, a thicker, richer chunk of meat. I don't think I've ever had a piece of pork on purpose, but if I was a pork-eatin' man, I have no doubt that these pieces of pork would be delicious. The high quality of the meat must be why prices were on the high side - 800 yen for a basic bowl with no toppings. The noodles were on the medium-thin side, and the soup was a tonkotsu-fish stock blend. But, like Watanabe, Ore no Sora's soup was a bit too fishy for my taste. I got an ajitama egg, which wasn't as totally perfect as Afuri's, but still very solid, or rather, nice and melty inside. However, it seemed to me that the portion of noodles was a bit smaller than most places, and the whole experience felt kind of rushed. The noodles came fast, I ate them fast, and it seemed like I was only in the store for a handful of minutes total. They must be used to long lines, so they probably try to "turn tables" as quickly as possible. Most people around me had ordered the thicker tsukemen, which I thought looked appealing, but in retrospect it might just have been that I was feeling a bit unsatisfied. I'm still not sure how I feel about Ore no Sora - I definitely didn't love it, but I somehow feel drawn to go back and give it another shot sometime.